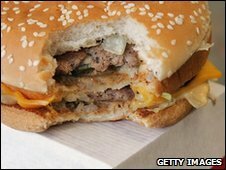 A McDonald's outlet in the Netherlands was wrong to sack an employee for giving a colleague a piece of cheese on a hamburger, a court has ruled. The waitress was fired last March after she sold a hamburger to a co-worker who then asked for cheese, which she added. The fast-food chain argued this turned the hamburger into a cheeseburger, and so she should have charged more. But Leeuwarden district court ruled a written warning would have been more appropriate. McDonald's was ordered to pay the former employee more than 4,200 euros ($5,900; £3,660) for the last five months of her contract. The fast-food chain had argued that the waitress - who was employed at a branch in the northern town of Lemmer - had broken staff rules prohibiting free gifts to family, friends or colleagues. But the court said in its written judgement: "The dismissal was too severe a measure. It is just a slice of cheese," reports AFP news agency. The ruling comes days after McDonald's reported an increase in net profits by almost a quarter in the last three months of 2009.